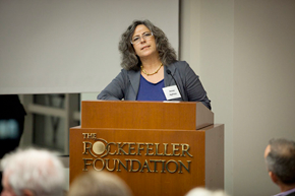 Anne Aghion is a sought-after speaker at universities, museums, film festivals, as well as institutes dedicated to areas ranging from the arts to policy to the study of science. Teaching has also become an important pursuit for Anne Aghion, with a special interest in countries with fledging film industries. In the spring of 2012, she gave a TEDx Talk in Paris, France, entitled “Filming Unanswerable Questions from Rwanda to Antarctica,” and in November 2012, delivered the keynote address at the Stanford Interdisciplinary Conference on Conscience at Stanford University. She is regularly invited to screen her films at venues across the globe. Over the past three years, she has led documentary filmmaking workshops at the Ecole supérieure des arts visuels de Marrakesh in Morocco and the Académie libanaise des Beaux Arts in Lebanon. 2012 STANFORD UNIVERSITY (Stanford, USA). Keynote speaker, Stanford Interdisciplinary Conference on Conscience – Keynote Speaker. 2012 TEDx ESCP “Making a Difference” (Paris, France). Speaker, “Filming Unanswerable Questions from Rwanda to Antarctica”. 2012 NEW YORK WOMEN IN FILM AND TELEVISION (New York City, USA). Panelist, On Their Own: A conversation with women documentary directors braking barriers. 2009 UNIVERSITY OF SOUTHERN CALIFORNIA (Los Angeles, USA). Panelist, Visible Evidence Conference: Genocide Survivor Testimony in Documentary Film. 2009 UNITED STATES INSTITUTE OF PEACE (Washington, DC, USA). Participant, Strategy Workshop on Gender, Conflict and Peace-building, whose aim was to inform the direction of a new Gender Program. 2008 SAN FRANCISCO EXPLONATORIUM (San Francisco, USA). Speaker, Ice Stories. 2007 AMERICAN MUSEUM OF NATURAL HISTORY (New York City, USA). Speaker, New York City International Polar Weekend. 2006 BARNARD COLLEGE (New York City, USA). Panelist, Women and Film: Behind the Scenes, as part of Reunion 2006. 2005 ECOLE SUPERIEURE DES ARTS VISUELS DE MARRAKECH (Marrakesh, Morocco). Speaker, Image & civilisation: représentations visuelles et identitiés collectives. 2011 & 2012 ACADEMIE LIBANAISE DES BEAUX ARTS (Beyrouth, Lebanon). Documentary Film, Master Level Course: Coached ten 4th year film students in an intensive two-week exercise to create three ten to fifteen minute documentary films from start (identifying stories and subjects) to finish (finalizing the films) in an immersive geographical situation. 2010 & 2011 ECOLE SUPERIEURE DES ARTS VISUELS DE MARRAKECH (Marrakech, Morocco). Proposal Writing for Documentary Film, Master Level Course: Five of fifteen projects presented in final pitching sessions to broadcast professionals from Europe and Morocco resulted in commitments and/or possible strong interest from the television commissioning editors. 2010 UNIVERSITY OF LONDON, SCHOOL OF ADVANCED STUDY (London, UK). Sawyer Seminar on Human Rights: Speaker as part of an Andrew W. Mellon Foundation grant to conduct a Sawyer Seminar on the theme of “Fratricide and Fraternité: Understanding and Repairing Neighbourly Atrocity.” The series consisted of nine distinct seminars, each a day long, that were focused on specific themes. 2010 UNIVERSITY OF WISCONSIN-MADISON (Madison, US). Sawyer Seminar on Human Rights: Speaker on Representation and Human Rights as part of an Andrew W. Mellon Foundation grant to the Human Rights Initiative at the University to conduct a Sawyer Seminar on the theme of “Vulnerability and Resilience: Rethinking Human Rights for the 21st Century.” The series, which ran from February 2010 to April 2011, consisted of nine one day seminars that focused on different themes.